The College of the Canyons theatre department started its 5-day run of The Heidi Chronicles Wednesday in the Santa Clarita’s Performing Arts Black Box Theatre. This Pulitzer prize and Tony Award-winning play, written by Wendy Wasserstein, follows the influential steps of Heidi Holland (played by Breanna Hall) as she finds her way into becoming a successful art historian during a time of social change for women during post-war America. 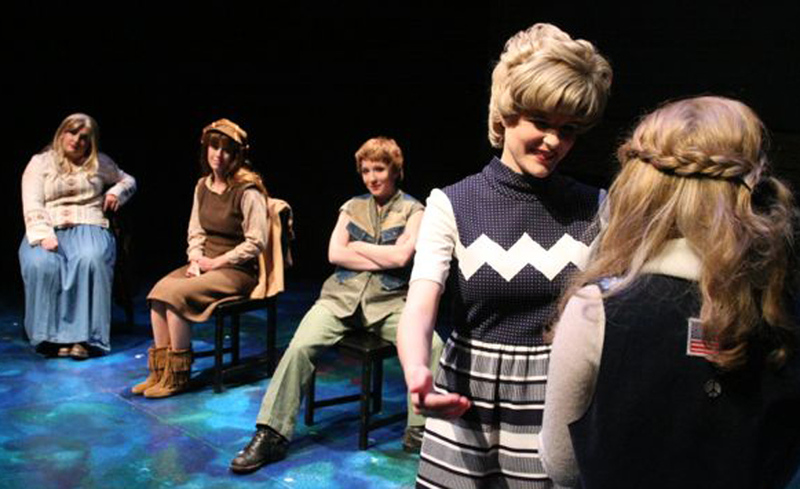 The play starts with a young Heidi in 1965 and ranges over a 25-year period ending in 1989. Audience members get an interesting insight on the feminist movement during the seventies and the significant progression women made in society during that time range. Alongside Heidi, the other characters in the play feature headstrong and independent women who take on the struggles and stereotypes against women, proving that women can “have it all” and not be tied down to the standard gender roles labeled by society. 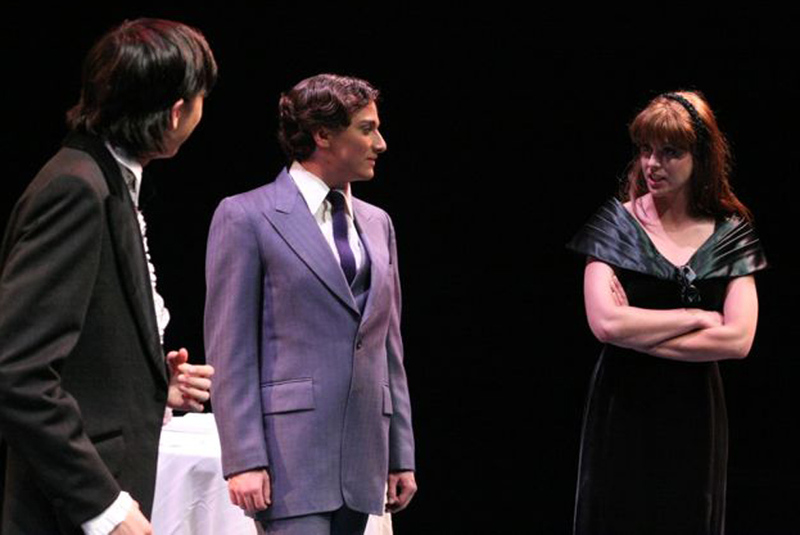 Despite the female-based cast, the play also features men that play an important role in Heidi’s life and the play’s overall theme. Peter Patrone (played by Devin Heath) plays the role of Heidi’s best friend that she meets in high school. Scoop Rosenbaum (played by Daniel Tominaga) is Heidi’s womanizing off and on and off again lover. The entire cast ties the show together creating an interesting mix of highly contrasting characters that all complement each other wonderfully. The play starts off in 1989 with Heidi giving a lecture to her art history students about the work of great female artists in the last three centuries. She praises the work of the artists but points out that as talented and influential as they were during their time, their art remains unknown and nonexistent in art history textbooks. The play then flashes back to her high school dance in 1965 with her best friend Susan (played by Caitlin Looney). The play then goes in chronological order showing the major turning points of her life and comes full circle to 1989 again. The Black Box is the perfect venue for a play like The Heidi Chronicles, due to its small cast and understated tones. The closeness and intimacy of the Black Box Theatre allows audience members to see the subtleties of each performance as well as the magnitude of the big picture and theme. The set includes a screen that stands center stage projecting images related to the scene and acts as the show’s backdrop. The disco ball above the stage set the tone for numerous scenes like dances and starry nights. Also, Rock N’ Roll music from the era played throughout the performance transporting the audience into the atmosphere of the play. Overall, The Heidi Chronicles is a witty and comical play with serious undertones that express the endeavor for gender equality and equal rights. There were strong and fully developed performances from the major characters as well as the actors who played multiple roles, adding to the entirety of the play. “I am pleased with the quality of the performances. We have a group of very talented and dedicated actors involved in this project,” says Wickline. The play will continue its run from Thursday, March 29 to Saturday, March 31 at 8 p.m. and Sunday, April 1 at 2 p.m.